It is time for HD videos now. And as far as HD video is concerned, most of people would like to get a full HD effect, which is also named as 1080P videos. For most of HD camcorders, they will shoot 1080P Full HD videos, or called AVCHD because the videos are in MTS extension. For most of iMac guys, iMovie is widely used for video editing. iMovie will help you do some nice editing jobs to your videos. You can join, cut or trim the videos with it. And it provides certain special effects, such as fade in and fades out, rotate the image, and mute the sound, etc. in addition, you can add some texts on the frames. But have you noticed one issue in this situation? iMovie will not support the importing for 1080P, or so-called Full HD videos! It is terrible enough. When attempting to import the Full HD file, an ugly message from iMovie will pop up. But, the most frustrating thing is that iMovie will support 1080i files importing. UGHH, it seems that Apple do not like real Full HD? Stupid enough! In addition, even though your file is in 1080i, MTS extension will not be loaded into iMovie easily. What I mean is that you have to pass through a render process in the iMovie. During the rendering, the only thing you can do is to wait! So another suitable format is necessary. How to Import 1080P Full HD Video into iMovie? 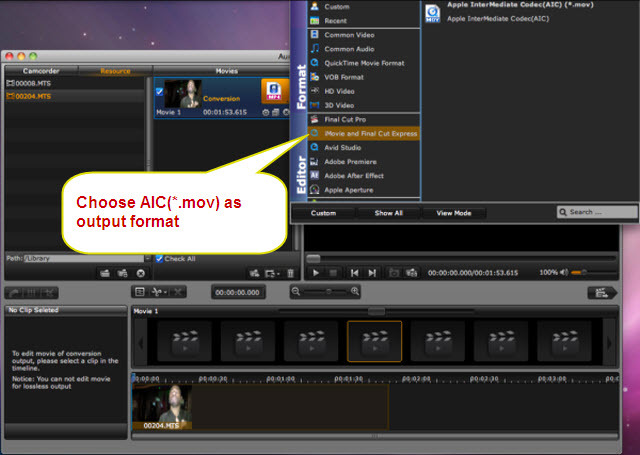 And what is the best format for iMovie? I am sure that most of people will think about the conversion, or encoding. Yes, you can Google out many conversion tools, which are named as MTS Converter or AVCHD Converter. But for most of them, you can just convert 1080P movie to other formats; but you will not be able to get the most proper format. What is the best format for iMovie? The correct answer is Apple Intermediate Codec(AIC). After free trial many tools, I would like to say Aunsoft Final Mate for Mac is great. 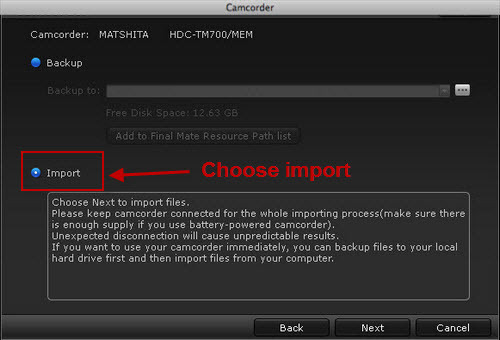 It will be able to help you easily get files from your HD Camcorder directly and convert MTS to AIC format. Another important thing is that Aunsoft Final Mate provides 5.1 channel output for Apple Intermediate Codec(AIC). It means you can get a MOV, in Apple Intermediate Codec(AIC), with 5.1 channels in audio part, which provides you good surrounding audio effects. That's an ideal solution for 1080P Full HD videos to edit in iMovie.